If you are a beginner, you will usually sew normal fabric with straight stitch. But by the time being, your skill and experience will grow; you will shift to different types of fabric and try different basic and decorative stitches. Here comes the question. Does all needle suit with all the fabrics? The answer is No. In advanced level, when you will sew different fabrics, you need to select a perfect needle for that project. Now I am going to tell you about different type of needle you should appoint while sewing different kind of fabric. You can use this needle if your apparels are made of woven fabric (such as: cotton and linen). This type of needle causes a minimum amount of puckering and allows you an even stitch with no damage to the relevant fabric. You should not use them if you are sewing any knit garment because it causes skipped stitches. It is recommended for edge stitching on a woven fabric, sewing finely woven fabrics or heirloom stitching. It also a distinct choice if you are sewing synthetic suede. Regular Point Needle has different sizes, varies from finest size 9 to heaviest size 18. It has a little bid rounded point such as the ball point needle. Universal Point Needle is used for everyday sewing purposes especially with woven and knit fabrics. The fact is it is tapered in such a way that it can easily slips through the fabric wave of the knit. Generally this kind of needle comes with your sewing machine. Universal Point needles size varies but the most popular sizes are 14/90 and 11/75. 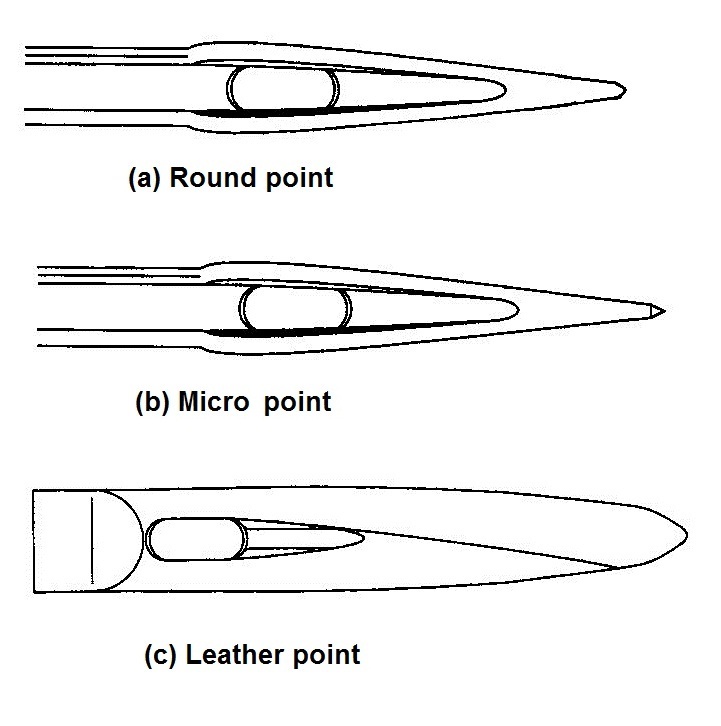 Ball Point Needles are designed especially for using with knit and stretch fabrics. The unique thing in this needle is, it has a rounded point other than sharp. The curve of the needle increases with the size of the needle. The needle point is more rounded in a larger size needle. Ball point Needle gently pushes between the yarn of the fabric rather than piercing just like the Sharp Point Needles Do. If you are sewing interlock knits or coarse knits, ball point needle will be a great option. Its size varies from 9 to 16. The 16 size needle has the most rounded point. This kind of needle has a larger eye so that it can accommodate the thicker embroidery threads. It also designed in a way so that it can protect decorative threads. Quilting Needles are also known as Betweens. It has a trapped point which allows you to stitch numerous fabric layers. The tapering point of the quilting needle prevents the damage of the heirloom quality of the fabrics. These needles are usually small and stronger than the normal needles. It carries a small eye. The available sizes are 9, 10, 11 and 12. These Needles are used with heavy topstitching threads. These needles have extra large eyes and deeper groove. Double thread can be used in this needle with a view to more accurate stitching. It can really make a notable difference if you can apply the correct topstitching needle. It is an exceptional type of needle which is appointed in the leather or vinyl sewing operation. It can easily pierce a fabric but create a hole. The wedge shape needle is a superior needle for piercing the tough and unyielding fabrics like leather. Their size varies from 11 to 18. The smaller are used for soft and pliable leather and the bigger are used for heavier or multiple layers. If you are interested in about “How to find the best sewing machines for beginners?” please read here!